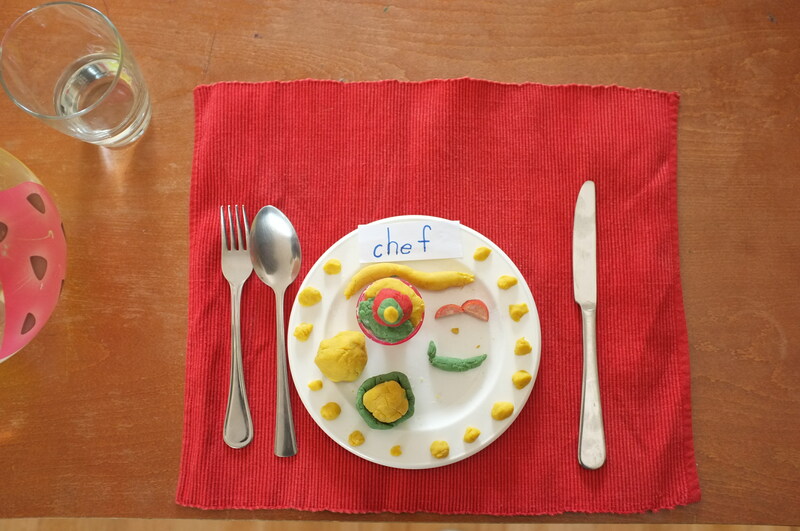 A recent Sydney Morning Herald article about the huge range of holiday activities on offer for kids these days suggested that the cost of feeding and entertaining children during holidays is around $100 per day. It featured three typical Sydney families spending roughly this amount – one with three children, one with four, and one with five. This was just the cost of doing things around Sydney, not taking the family away anywhere. We’re coming to the end of a three-and-a-bit week school holiday. Let’s say it was three weeks, 21 days. I didn’t happen to have a spare $2100 sitting around to pay for a holiday and I set myself a challenge, to go as cheap as possible without raising the suspicion or the ire of my kids. I was also too disorganised/lazy to do the few organised free local activities (at parks, shopping centres, libraries etc.) that meant I would have to get my lot somewhere at a certain time and be tempted to buy lunch afterwards or something else. The FRUGAL HOLIDAY CHALLENGE Take five children under 11 and give them a fun, low-cost school holiday with a limited budget and without sticking them in front of the TV for hours and hours. Three of them need intensive swimming lessons. Continue to meet a couple of writing deadlines as well. The BUDGET $15 a day, $315 total. The TOOLBOX I had a house, a car, a backyard, friends and relatives, and my husband for one of the week days. I also had a $50 gift card someone had given us to use for the kids. Tidying and re-organising your room was a classic school holiday activity when I was growing up. 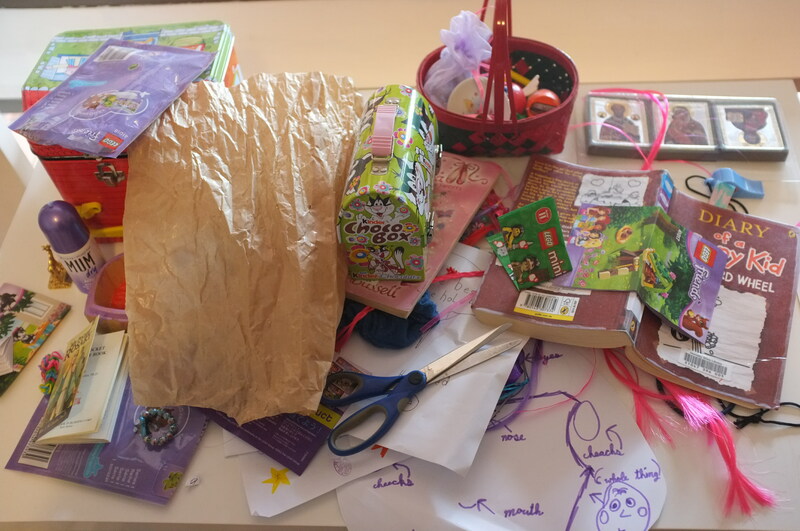 This was the top of one daughter’s drawers halfway through the job of clearing it off. Like me, once they get started they don’t mind doing it. Week 1. Fun at home, the local library and the park. The kids figured after weeks of 6.30am wake ups that it was just really nice to sleep in a little and hang around in their pyjamas until lunchtime. We spent one day out going to the library for books and DVDs and to the local park, but the rest of the time we stayed at home. They played. The play dough took up a whole day. We made pizzas from scratch one day. I let them open a game from my ‘gifting box’ another day. My eldest daughter went to a friends’ house on the Friday. I worked an hour or two most nights. It was great for a while and cost nothing but obviously staying home in our pyjamas most days would wear really thin, really quickly. Seriously…all day?? But play dough is usually off-limits in our house so there was a novelty factor I guess. Cost – free. Week 2. Catch up with friends. We had friends over one day, and met up with different friends at a park on another day. I had three children in a swimming class each weekday, the third child’s lessons were half-price. During the lessons I chatted with my eldest daughter while the one-year-old slept or we went for a walk. One child moved up a class level which was great. We picked up hot chips on the way home one day to make chip sandwiches. We did the library again. On the weekend we had lunch with friends at their house, who have four children our kids are friends with. I worked an hour or two some nights and my husband took them all out visiting on the Sunday afternoon so I could do a block of work. Cost – $200 swimming lessons, $8 chips. 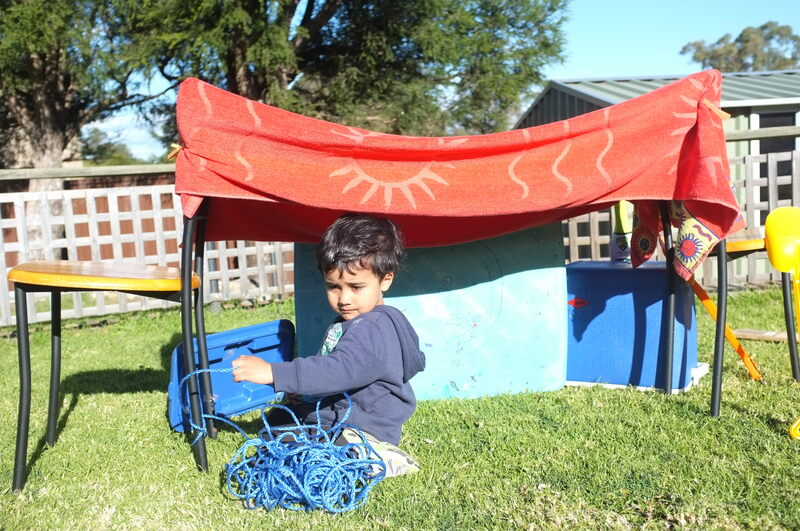 The kids voted this the best tent because they could all squeeze ‘into’ it -not bad for the youngest contestant! They spent a whole afternoon engrossed with this camping game. The three eldest children got taken to dinner and a show at the Sydney Opera House’s Playhouse by their aunty and uncle. The next day all except the one year old were taken to a movie by their dad with discount movie tickets. We went to the local garden nursery which was having a sale to buy seeds, potting mix, stakes, and a couple of pots using our gift card and had a gardening day. Dinner one night was bought sushi and nori rolls for a treat (I usually make nori rolls which is heaps cheaper, but my repertoire is getting boring). 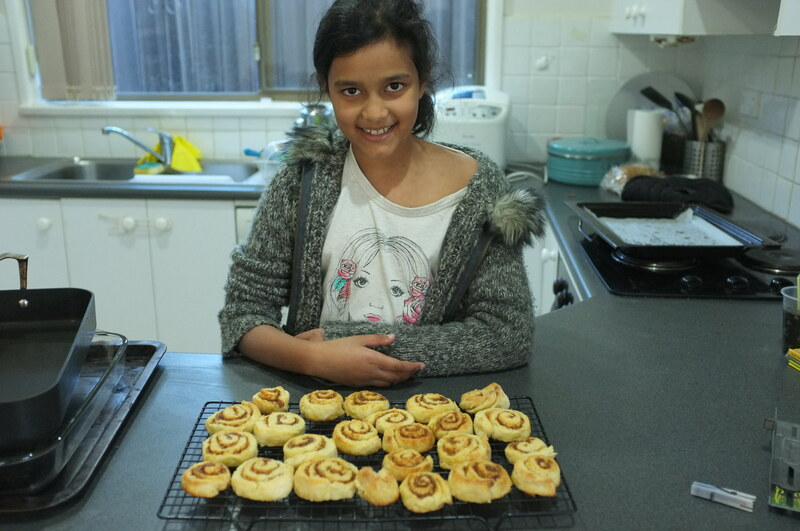 Daughter number 1 baked cinnamon scrolls for an afternoon tea and we did the hot chips lunch thing again. I did a three-hour work stint one night and will do another block on Sunday. Saturday will be a birthday/catch up lunch at a grandparents’ house. 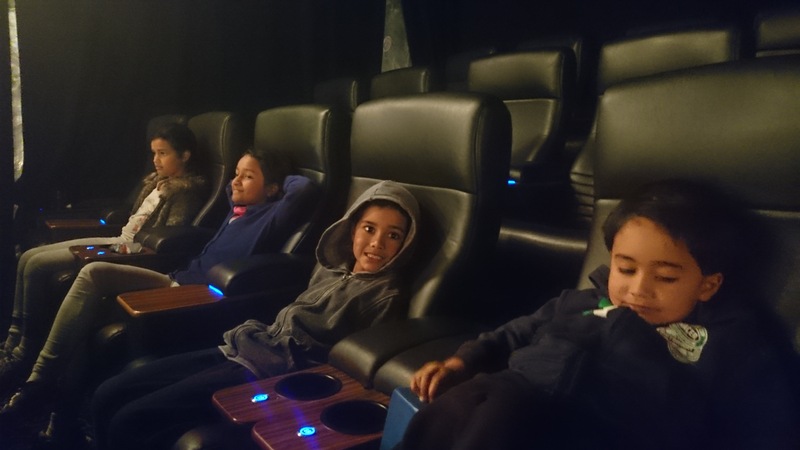 Cost – $32 nursery, $46.50 movie tickets, $28 sushi, $8 hot chips. Mixed spice scrolls are easy to make and these were all scoffed about 10 seconds after I took the photo. Total cost for three weeks – $322.50. Only slightly over budget. If I count the swimming classes, which are more of a necessity than a holiday activity, then it comes in at $122.50. Either way, it came in a lot cheaper than any of the holiday fun featured in the SMH article and we didn’t hear any (serious) complaints about being bored. It’s been a pretty good family holiday. The kids played, they fought, they negotiated, they made up crazy stories and crazy games. They got up before me one day and surprised me with breakfast in bed! They made lots of messes and I helped them to clean it all up again. They did ask me a few times if we were going to ‘do anything special’ next holidays. I get the feeling that they thought these ‘home day’ holidays were fine, as long as there was something different to look forward to next time! Lucky for them we’re planning a trip to Canberra to attend a wedding and will do some of the touristy stuff there. What do you think is reasonable to spend during the school holidays when you don’t leave town?